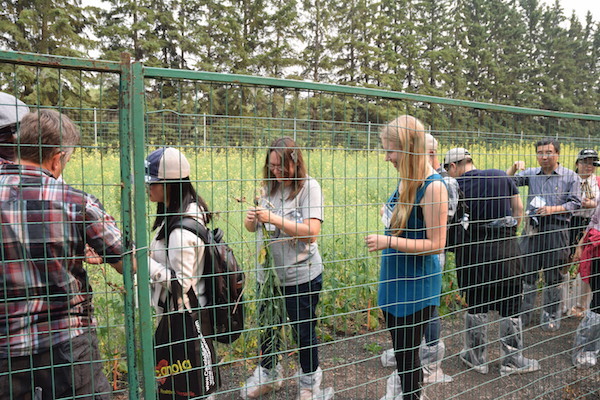 Attendees at the International Clubroot Workshop tour a gated pathotype nursery near Edmonton. Clubroot is getting worse around the world. Tight rotations of brassica crops have led to an increase in clubroot prevalence everywhere. Allowing at least two years between host crops (including canola) is proving to be a key management strategy globally to reduce or prevent spore build-up in soil. Clubroot resistance failure is increasing around the world. To help reduce selection pressure for clubroot pathotypes that can overcome the current resistance traits, the Canadian approach is to deploy clubroot-resistant varieties as soon as clubroot is seen in an area. This will help to keep spore counts as low as possible for as long as possible, but this needs to be combined with other management approaches including a minimum two-year break between canola crops. Note that with clubroot found in more areas in Western Canada this fall, it could mean high demand for CR varieties for 2019. Demand could outstrip supply for 2019. New resistance sources may provide some reprieve in the near term, but this is not a silver bullet. Rotation is still required. With new resistance sources, breeders have the opportunity to stack traits. Preliminary research results suggest that stacking R genes may be more durable than single genes. Scout late in the season. Start off at field entrances or low spots. Do random searches for galls, even if plants show no obvious above-ground symptoms. When above-ground symptoms (such as wilting or pre-mature yellowing) appear, definitely look below ground for galls. If small patches of clubroot are identified, hand-pulling or roguing infected plants and destroying the galls can literally save the field and farm. Liming has shown enough success in preliminary trials in Alberta that it warrants consideration and research funding. Adding enough lime to increase pH to 7.3 has shown to significantly reduce clubroot gall formation (and spore production) in fields with high levels of clubroot. Grassing in patches can also reduce the spread of clubroot from that patch, as long as the grass is left for enough years to significantly reduce the viable spore load in the soil. That would be a minimum of two years and perhaps more than five. Volunteer canola and brassica weeds may provide a larger disease bridge than we initially thought. Common weeds such as stinkweed, shepherd’s purse, flixweed and mustard are clubroot hosts, so these weeds producing galls in a wheat field, for example, will cancel out the benefit of crop rotation. Infected galls produce more spores than we originally thought. One heavily-infected plant could product 16 billion spores. While one pathotype group will usually dominate the spore population, if as little as 0.005% of those spores are from pathotype groups that can overcome current resistance sources, that is still 800,000 spores per plant. In clubroot modelling, 10,000 to 100,000 spores per gram of soil is enough to cause observable levels of infection. Note, these numbers are “spores per plant” and “spores per gram of soil”, but 800,000 spores per plant could produce a threshold amount of spores per gram of soil in the topsoil layer immediately around that plant. Keep boots, tools, quads and equipment clean to slow the spread of clubroot. The best sanitization product is bleach in a 2% solution. Read Mike Harding’s recent study. Clubroot is the “bad guy” here. Farmers who discover clubroot early and take action should be commended. Take advantage of opportunities to learn from farmers, agronomists and researchers who have first-hand experience. clubroot.ca has tips to identify, prevent and manage clubroot before it gets to your area.